It's our signature Yarn Swift only better: it's in black with golden brass hardware. An essential tool for any knitter or crocheter, the Yarn Swift holds your hanks or skeins of yarn in place as you wind them into balls. Simply clamp the swift onto a table or counter top to start winding yarn neatly and easily. 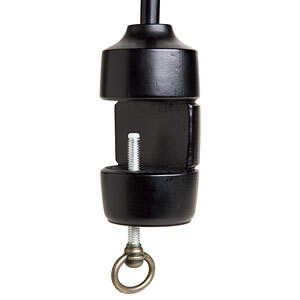 Starting with the umbrella in the down position, place the open loop of the hank over the swift and pull it lightly so the far side of the hank is against the center of the umbrella. Then, use your free hand to slide up the umbrella clamp and open the umbrella to snuggly fit the circumference of the hank. 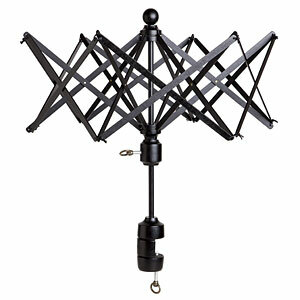 Finally, secure the umbrella clamp in place and then wind away! For added durability, the swift features metal hardware. 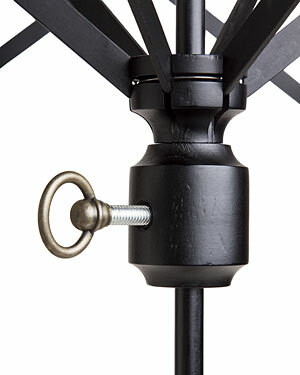 The metal screws feature a plastic stopper at the end to prevent scratches when clamping the swift onto a table. For best results, use in tandem with the Knit Picks Ball Winder. Measures approx. 26" (66cm) in diameter (68"/173cm circumference) and 26" (66cm) tall when open. Clamp opening fits tables up to 1 1/2" thick. Note for retail customers: This item ships separately. No additional charges are required. Orders containing a swift cannot be expedited. If you wish to have the rest of your order expedited, place a separate order for the swift.